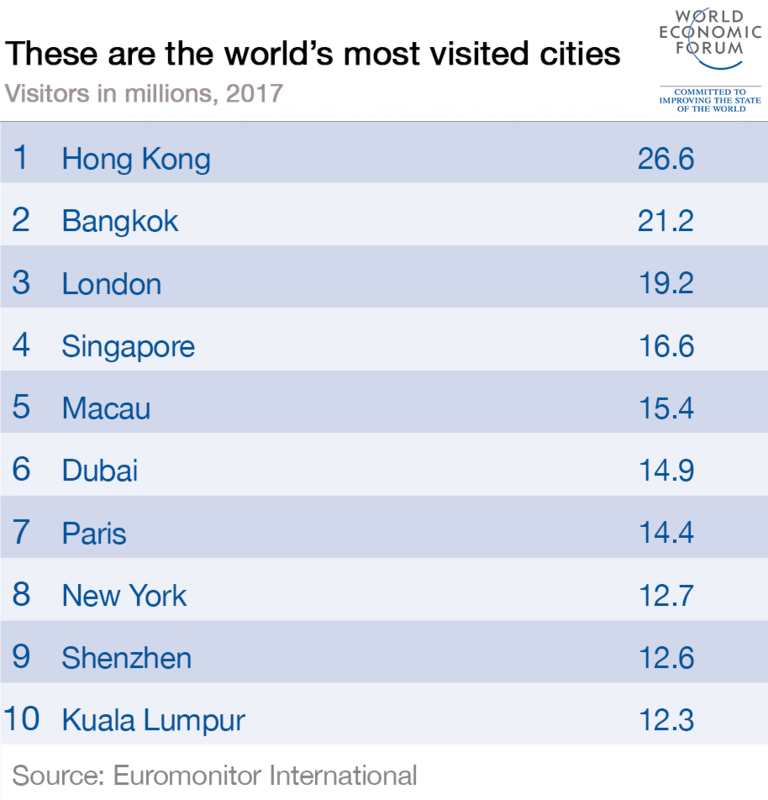 Hong Kong has held onto its title of the world’s most visited city for the ninth year in a row in market research firm Euromonitor International’s latest Top 100 City Destinations Ranking. The annual league table is based on the number of international tourists who spend 24 hours or more in a city. 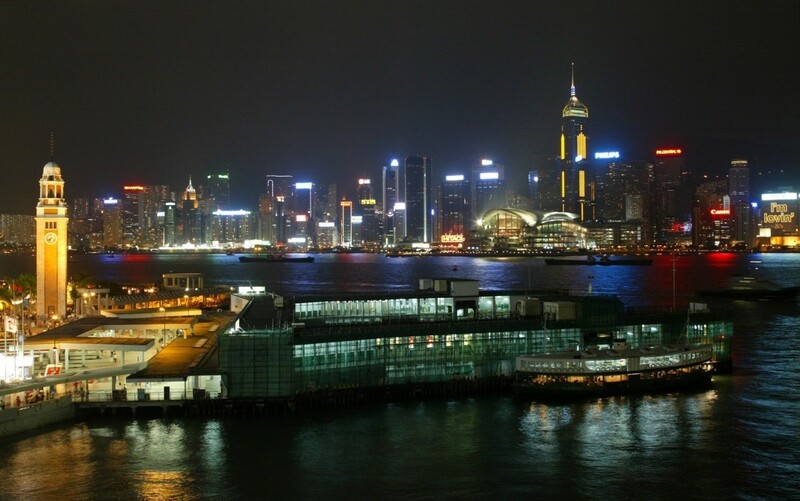 Hong Kong pulled in an impressive 26.6 million visitors in the previous year, largely thanks to arrivals from mainland China. In second place, with 21.2 million visitors in 2016, is Bangkok, which overtook London in 2015. Singapore, currently in fourth place, is also set to outpace London and become the third most-visited city by 2025. Asian cities dominate the ranking: there are 41 cities from the Asia-Pacific region in the 2017 list, compared to 34 in 2010. And this number is expected to grow to 47 by 2025. A major factor behind the growth of international visitors to Asian cities is the “inexorable rise” of China’s outbound tourism market, which is the largest in the world, the report says. It predicts that Hong Kong’s international visitor numbers will fall to 25.7 million during 2017, because of increased tensions with mainland China. But it expects the city to bounce back, with arrivals set to hit 45 million by 2025. Euromonitor says the performances of European cities have been affected by recent events such as the Eurozone crisis, the influx of refugees, Brexit and terrorist attacks. But tourist magnets such as London and Paris remain resilient. And some destinations in Greece, Italy and Spain saw growth during 2016 as a result of unrest in the Middle East and North Africa. Despite suffering terror attacks and the political turbulence around Brexit, London was Europe’s most visited city in 2016 with 19.2 million visitors. In fact, a weaker pound as a result of the Brexit vote has helped attract more visitors to the UK. In the longer term, though, the outlook for London is more gloomy, with Euromonitor predicting a slide to sixth place by 2025 as tourism rises faster in Asian cities. The highest-placed US city in the ranking is New York, which remains in eighth position with 12.7 million visitors, just ahead of Shenzhen at 12.6 million. Nigeria and India are making moves to explore opportunities in renewable energy development as part of the international agreements signed by both countries.Indian High Commissioner, Nagabhushana Reddy, at a Business meeting in Abuja, said the home government was committed to deriving at least 30 per cent of its power needs from renewable energy by 2030. Reddy noted that exploring areas of cooperation in renewable energy would build on existing partnerships between both countries, especially as Nigeria, was member of the International Solar Alliance (ISA). Reddy also said that both countries would sign a Memorandum of Understanding (MOU) in the renewable sector to create a joint working group to develop projects for enhanced and effective collaboration. He added that promoting synergy among stakeholders would create jobs and fast track economic development in line with the government’s economic growth plan.A representative of Nigerian chapter of Associated Chambers of Commerce and Industry of India, Rajneesh Gupta, said that there are ongoing enlightenment campaigns on promoting renewable energy in Nigeria. The bears strengthened hold on the equity sector of the Nigerian Stock Exchange (NSE) yesterday, as more bluechip stocks depreciated in price, causing market capitalisation to dip further by N9 billion. Specifically, at the close of transactions yesterday, market breadth closed negative, with 12 gainers against 35 losers.Precisely, Japaul Oil led the losers’ chart by 7.32 per cent to close at 38 kobo, while Eterna Oil shed 5.04 per cent to close at N6.41 per share. First Aluminium and Prestige Assurance depreciated by five per cent each to close at 38 kobo and 57 kobo, respectively, while Cement Company of Northern Nigeria declined by 4.86 per cent to close at N23.50 per share. Union Bank appreciated by 4.24 per cent to close at N6.15, while Africa Prudential Insurance gained 3.90 per cent to close at N4 per share.On the other hand, C&I Leasing recorded the highest price gain of 4.66 per cent, to close at N2.02 per share, as Unity Bank gained 4.49 per cent to close at 93 kobo, while Transnational Corporation of Nigeria (Transcorp) appreciated by 4.38 per cent to close at N1.43 per share. Consequently, the All-Share Index (ASI) shed 24.61 absolute points, representing a decline of 0.06 per cent to close at 37,963.93 points, while the market capitalisation declined by N9 billion to close at N13.752 trillion.The decline was occasioned by losses recorded in medium and large capitalised stocks, amongst which are Okomu Oil, Cement Company of Northern Nigeria, Seplat Petroleum Development Company (Seplat), Mobil Nigeria and Zenith Bank. However, the volume of trade depreciated by 31.02 per cent to 372.24 million shares, worth N3.18 billion, and traded in 3,800 deals.Transactions in the shares of Sterling Bank topped the activity chart with 172.63 million shares valued at N241.03 million, as Zenith Bank followed with 31.54 million shares worth N792.74 million, while Transcorp traded 22.92 million shares valued at N31.98 million.United Capital traded 21.18 million shares valued at N69.34 million, while UBA transacted 16.62 million shares worth N175.79 million. Labour broking, working hours and minimum wages are hot potatoes in South Africa but the country is not alone in grappling with them. From Angola, Kenya and Nigeria to Tanzania, the United Arab Emirates (UAE) and Israel, employers are dealing with many of the same employment challenges as in South Africa – along with some twists unique to the jurisdictions they operate in. This is the view of Lusanda Raphulu, partner at Pan-African law firm Bowmans, after moderating one of the sessions at the 2018 Africa/ Middle East Client Conference of the Employment Law Alliance (ELA). When it comes to the latest employment law trends, there are striking similarities across much of Africa and the Middle East. Take the question of working hours which, it turns out, is highly topical in Israel and the UAE at the moment. In the UAE, a major challenge for many employers is the extremely low oil price, which is hitting business hard. One obvious cost-cutting method is for employers to implement more flexible working arrangements. This is easier said than done as the labour laws that were written in 1980 are far from flexible. Many employers who can no longer afford to have all their employees working full time would like to introduce part-time work or shifts. However, the law in the UAE prohibits anyone from working more than eight hours a day, and part-time work is not an option for foreign workers (making up the majority of the workforce) who must have the sponsorship of one, full-time employer. There is no easy way around this, with penalties for breaching the employment regulations including fines, imprisonment or deportation. The only way to introduce flexible working arrangements is to obtain direct approval from the Ministry of Labour, a difficult and lengthy process that can take eight or nine months to complete. The situation is similar in some ways in Israel (whose labour laws were written in 1951), where the working week was recently reduced from 43 hours to 42 hours, without any cuts in pay, under a collective agreement between unions and employers. One of the difficulties with this change is that numerous employees in Israel are paid by the hour and the complexities of adapting reduced working hours for hourly paid workers were not fully taken into account. This is a practical consideration that has had perplexed employers knocking on the door of law firms, seeking advice. Still, in a country whose employees work significantly longer hours than their counterparts in Europe and the United States, a shorter working week is considered a welcome step towards better work-life balance. Kenya is also grappling with the practical consequences of a change in employment laws, this time requiring employers to give nursing mother’s time off during the working day to breastfeed their babies. This has generated a discussion among politicians, lawyers, the media and celebrities with some commentators praising the government for its commitment to maternal and infant health and others expressing grave reservations about the practicalities and added burden on employers. Another controversial labour issue in Kenya currently is the minimum wage, which differs in urban and rural areas and recently increased by about 5%. Commentators feel that the increase could have serious implications for certain industries, especially the private security industry. It has become the norm in Kenya for homes and businesses, especially those of national and international companies, to be guarded 24 hours a day but this is only possible while wages are low – a dilemma that highlights the tension between protecting workers’ rights and minimising job losses caused by cost cutting. Meanwhile, in Nigeria and Tanzania, a labour law issue preoccupying many employers, not to mention the labour courts, is labour broking and specifically the issue of who the employer is. In Nigeria, this used to be a straightforward matter. For many years, the broker was the employer. That has no longer been the case since the National Industrial Court of Nigeria ruled that a sacked worker who went to court had two employers, the labour broker and the end-user. Since there is a significant gap between what employers and labour brokers pay, this could have expensive implications for employers. Experts suggest a rule of thumb for employers trying to keep their costs down in Nigeria is to keep their distance from day-to-day matters affecting labour-broking employees. This way labour brokers, and not employers, are the ones managing the employees, which reduces the risks for employers. Although Tanzania does not yet have labour-broking regulations, the position is similar: the entity that has day-to-day control of the employees is considered to be the employer. The risk of the same employee receiving benefits from two employers has prompted some of Tanzania’s largest institutions to move away from labour broking and to start hiring people themselves, even though this is complicated and could virtually double their employee costs. One country where the law is cut and dried on labour broking is Angola. Employers in that country are discouraged from using the services of labour brokers unless this is temporary and strictly for short periods. Since 2016, the maximum period for hiring temporary workers has been two years. After two years, the employer must hire the person directly and cannot get around this by replacing him or her with someone else as the law prohibits such replacement. All in all, the discussions at the ELA conference showed that South Africa is far from alone in dealing with employment law challenges such as labour broking, minimum wages and the like. Other countries are in much the same boat and perhaps even navigating more challenging waters than South Africa’s currents.